What did she say about Social Media? I had the wonderful opportunity to speak at Cornerstone Christian Fellowship at the iConnect Event all about social media. This is a networking group that meets once a month. I spoke specifically on using Facebook for your business and because I specialize in business with products the very knowledgeable Jason Grosso from PC Made EZ spoke with me. So many of you have asked for the notes on the talk so I thought I’d post them for you! As a business, you have the opportunity to win hearts and minds every second of every day as long as you are paying attention! You know, companies changed greatly with the invention of the telephone, then the internet, then again with constant contact. But is your business changing in response to social media? Facebook presents unbelievable opportunities now that business happens literally at the speed of thought due to social media. Most companies are looking at Facebook massively incorrectly. They are looking at it as purely an acquisition vehicle, “find people who’ve never heard of us and sell them our products or services.” The thing is is that people already “LIKE” you if they’ve hit the LIKE button. Therefore, you need to be harnessing advocacy that already exists, rather than creating new advocacy. You’re preaching to people that already like you. Another big Facebook No-No is “yellow paging”. This is creating a Facebook business page and then not keeping it up, not posting on it. It’s become a static page and really is almost a disservice to people. On the topic of no-no’s add this one–constantly promoting yourself. Try to keep in mind this ration, 75% ORC (other relative content) and 25% self promotion. People will get tired of hearing all about what you sell or what service you provide. Don’t be jealous or selfish…share about others, this is how Facebook networking works, along with all other social media! I gave the example of The ReStyle Group. They are an interior design firm that writes a monthly featured entitled The Space Behind the Face **see the article they did on me here. In this feature they spend time understanding the links between the business owner and their personal space (their home). They don’t mention whether they decorated the space or had anything to do with it. But, the feature creates buzz and in turn, creates business for them. Focusing directly on your Facebook Business page…remember Branding and Logo are HUGE to your business. Think the Nike swoosh, the Starbuck’s face, ect. Pick your Profile Picture/Banner and stick with it! The Profile Picture/Banner is the most important visual element. It’s your brands KEY visual identity. Give it visual weight as it occupies the “power corner” of the page. The Profile Pic and the Photostrip should work together, ensure that each one affects and reinforces the other. The Thumbnail is the image that accompanies all posts & comments. Ensure you edit it properly. I also like to focus on the Landing Page/Like Page. This element is not “big” yet on FB but with all of the changes it’s going to be huge. It sets you apart, allows many functions i.e. video, link to website, capturing email addresses, ect. The Photostrip–Roll with Randomness! It’s 5 pictures that change places each time your reload your page. Ensure that you delete unwanted pictures. Be aware of the Featured Likes. These are opportunities for cross-branding and partnerships. You can edit the featured likes to ensure that they work with your brand. The bottom line in this is to think creatively with all the elements of your page! If you are struggling with any or all of the elements please don’t hesitate to email me or call me. I’d love to chat with you and help you get started. Facebook is my passion. 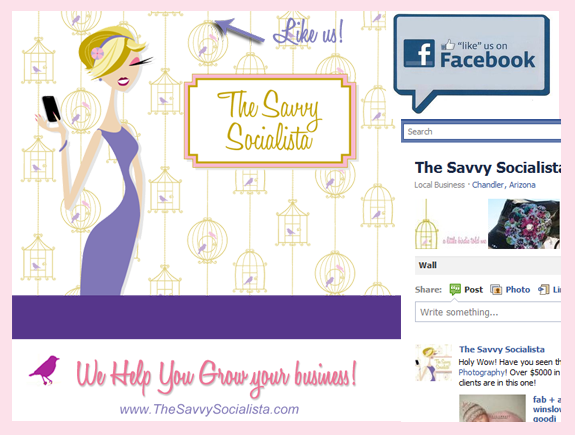 I hope this helps you get excited about your Facebook Business Page. Leave me your comments and let me know your thoughts on Facebook and all social media! Great info… thank you for sharing!!! I’m a little “fired up”!! !